Sergei Ivanov, the head of the presidential administration, said that the Federation Council has unanimously endorsed the President’s appeal. “All social and financial issues related to the maintenance of Russia’s Air Force servicemen, who will be involved in this operation, will be observed and all adequate decisions regarding the matter have been made,” said Ivanov. According to the official, Russia will use only aviation in Syria. “As our President has already said, the use of the armed forces on the ground theater of operations is excluded. The military purpose of the operation is the aviation support of Syrian government forces in their counteraction to ISIS,” Ivanov said. The operation of the Russian Air Force in Syria will have a specific time frame, the head of the Kremlin administration said. 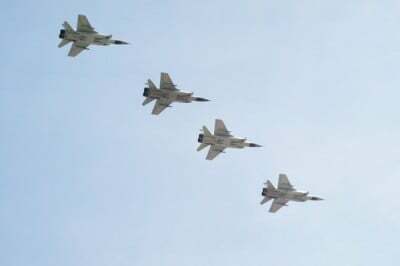 “This operation of the Russian Air Force, of course, can not last indefinitely and has a well-defined time frame. Yet, I can not announce either the dates or the amount of aircraft and the types of weapons that our Air Force will use in the operation,” said Ivanov. According to Ivanov, it does not go about the question of reaching either foreign policy goals or satisfying ambitions. It goes about national interests of the Russian Federation, he said. Representatives of the Kremlin administration said that Russia was the only legitimate party in the special operation in Syria. “The use of the armed forces is possible either under the UN Security Council resolution or at the request from the legitimate leadership of the country. In this case, Russia will be the only country that will be conducting the operation on a legitimate basis – at the request from the legitimate president of Syria,”Putin’ official spokesman Dmitry Peskov said. Noteworthy, during the talks with his US counterpart Barack Obama at 70th session of the UN General Assembly in New York, Russian President Vladimir Putin said that Russia did not have any plans to deploy ground troops in Syria. According to leading expert at the Center for Military and Political Studies of MGIMO, Mikhail Alexandrov, the United States intends to expand its influence in the world, especially in post-Soviet space. Pursuing this goal, the USA ousts Russia from everywhere, including from Syria. “Syria is our friendly state, and Russia has an army base there, so why should Russia leave? Is it just because Gen. Breedlove wants so? Is the US ready for war with Russia? Does America have the guts for it? If he asks himself this question seriously, he will understand that the USA is not ready for the war with Russia – the US is not strong enough for that,” the export told Pravda.Ru. Therefore, the expert continued, the US military should agree on a political settlement in Syria, on the basis of a compromise with Russia. At least, one needs to agree on a model of conduct in the areas where Russian and American aircraft will operate. Answering a question about the prospects of using Russian Armed Forces in Syria, the expert said that the news was expected, as the Russian administration had previously decided to increase Russian military presence in Syria. Russia is not likely to use strategic bombers in Syria, though. According to the expert, Russia may use extra powerful vacuum air bombs to attack the positions of Islamic State militants. An explosion of such a bomb can destroy a whole quarter. It would be enough for Russia to use Solntsepek volley fire systems to target ISIS terrorists in Syria. Any actions in Syria should be legitimized. All the panic rumors about the power of the Islamic State are nothing but mere declamation to mislead Russia and the Russian administration and convince them of the invincibility of the terrorists. “German Nazis had used the same propaganda techniques. One should pay no mind to all this media hype. Russia is capable of destroying any terrorists. Why should Russia lose to the Islamic State? We need to help Syria at this point – to destroy the military infrastructure of the Islamic State,” the expert said.